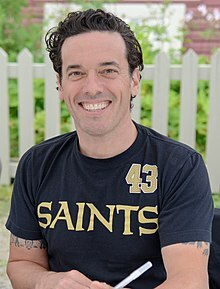 Joseph Boyden CM (born October 31, 1966) is a Canadian novelist and short story writer. Boyden is best known for writing about First Nations culture. Three Day Road, a novel about two Cree soldiers serving in the Canadian military during World War I, was inspired by Ojibwa Francis Pegahmagabow, the legendary First World War sniper. Boyden's second novel, Through Black Spruce follows the story of Will, son of one of the characters in Three Day Road. The third novel in the Bird family trilogy was published in 2013 as The Orenda. Joseph Boyden is a Canadian novelist, screenwriter, essayist, and public speaker. His bestselling novels have won numerous national and international awards (including the Giller Prize in 2008), and have been published in over 20 languages in more than fifty countries. Boyden grew up in Willowdale, North York, Ontario, and attended the Jesuit-run Brebeuf College School. The ninth of eleven children, he is the son of Blanche (Gosling) and Raymond Wilfrid Boyden, a medical officer renowned for his bravery, who was awarded the Distinguished Service Order and was the most highly decorated medical officer of World War II. Boyden studied humanities at York University and received his MFA in Fiction from the University of New Orleans in 1995. He was a professor in the Aboriginal Student Program at Northern College from 1995-1997. He taught at the University of New Orleans from 1998-2010, where he served as writer-in-residence. He was also a lecturer with the University of British Columbia's Creative Writing Program from 2013 to 2015. To date, Boyden has received five honorary doctorates and degrees. His first honorary doctorate in 2009 (Doctor of Letters, honoris causa) was awarded from Nipissing University. In 2013, Boyden was awarded a second honorary doctorate from Algoma University.. He was awarded a third honorary doctorate from Sir Wilfrid Laurier University in 2014, a fourth from Trent University in 2015, as well as an honorary degree from Humber College in 2015. Boyden was awarded the Queen Elizabeth II Diamond Jubilee Medal in 2013. He sits on the board of the Canadian Civil Liberties Association. In 2014 Boyden accepted a commission from the Royal Winnipeg Ballet to write a ballet about residential schools in Canada. Boyden's ballet Going Home Star — Truth and Reconciliation premiered in 2014 and traveled across the country. As a public speaker, Boyden regularly addresses Indigenous Canadian, environmental, and mental health issues. Boyden is primarily of Irish and Scottish ancestry. He was adopted as a sibling to Ojibway filmmaker Lisa Meeches in 2017. He also claims Nipmuc and Ojibway heritage. Boyden's claims to Indigenous heritage have been the subject of dispute following an APTN National News article, "Author Joseph Boyden's shape-shifting Indigenous identity" by Jorge Barrera, published December 23, 2016. Barrera's article investigates Boyden's past claims of Mi'kmaq, and Métis ancestry as well as his current claims of being Nipmuc and Ojibway. Barrera brought to light facts surrounding Boyden's uncle Earl Boyden, who went by the name "Injun Joe". Earl Boyden was an artist in Algonquin Park and was the subject of a 1956 Maclean's article titled, "The Double Life of Injun Joe", in which the author reports that he has no "Indian blood.". Barrera's search of Boyden's family tree could not locate any Indigenous ancestry. Boyden' mother was briefly interviewed via telephone by Barrera. She said that her son was researching her family's history. Boyden, who had refused an interview with APTN for the article, responded by Twitter on December 24. Boyden admitted he'd called himself Métis, but only meant the term to mean mixed blood. He continued to assert his maternal Ojibway and paternal Nipmuc roots. Subsequently, Rebeka Tabobondung, editor of Muskrat magazine revealed Boyden had told her he was from the Wasauksing First Nation. Tabobondung who is from Wasauksing followed up to find his family connection and could not. However, Boyden's family did own a private island near the community. Boyden has also at various times claimed to have heritage from the Ojibway of Cape Croker, the Huron-Wendat and the Red River Métis. Over the next weeks a series of Indigenous writers, activists and politicians including Wab Kinew, Drew Hayden Taylor Hayden King Ryan McMahon, and others wrote about the controversy in national media. They asked on what basis Boyden felt he had expertise to represent issues if he was not Indigenous, and asked to whom he was accountable, as some of the positions he was presenting seemed out of line with ongoing work in Indigenous communities Others critiqued Boyden for accepting prizes, speaking fees, and awards that were designated for Indigenous authors. They publicly noted there could be "room in the circle" of the Indigenous community, reconciliation if there was truth, whether or not he had any Indigenous blood, so long as he was honest and willing to earn his place. On January 12, 2017, Boyden gave his first public interviews since the appearance of the APTN article. He personally selected the interviewers who were both friends of his, Mark Medley of The Globe and Mail, and Candy Palmater a comedian who occasionally works at CBC. Boyden now admitted he had erroneously identified himself as Mi'kmaq in the past. He continued to identify as a "white kid with native roots", Ojibway on his mother's side and Nipmuc on his father's side. Boyden denied that he had relied on his identity as an Indigenous person to popularize his books, and he stated he had only won one literary prize based on heritage and little money. He did, however, apologize for taking up too much of the "air space" and stated he would do less public speaking, thus allowing for Indigenous voices to be heard in the media. Reaction to the interviews was mixed. Subsequent reports by Canadaland and other researchers turned up inconsistencies in Boyden's claims and failed to find any native ancestry in Boyden's background. In an August 2, 2017 essay in Maclean's magazine, Boyden stated that he took a DNA test which listed "Native American DNA". For Boyden's critics, the results mean little as broad DNA categories do not constitute membership to a nation. According to First Nations genetics expert Kim Tallbear, DNA testing for Native ancestry as a racial category is not scientifically possible, and is often confused with DNA testing that confirms specific familial lineage. During the defense of a lawsuit, Boyden had provided a photocopy of his "status card", a document appearing to be an ID card for the Ontario Métis Aboriginal Association (also known as the Woodland Métis Tribe). Research by journalist Eric Andrew Gee led to the following comment in the 7 August 2017 issue of the Globe and Mail: "the OMAA ... is a complicated and in many ways troubled organization held in low esteem by some prominent Métis Canadians for its legal and financial misadventures over the years, and its lax membership policy that does not require any proof of Indigenous ancestry. Nor does the group provide "status cards" – Indian status can only be conferred by the federal government. The ID Boyden flourishes like a trump in his affidavit is little more than a piece of paper." In a Supreme Court of Canada appeal about another issue (Document C28533, page 17), the government confirmed that OMAA (Ontario Métis Aboriginal Association) cannot provide individuals with Métis status: "membership in OMAA ... does not establish membership in the specific local aboriginal community for the purposes of establishing a s. 35 [treaty and aboriginal] right. Neither OMAA nor the MNO [Métis Nation of Ontario] constitute the sort of discrete, historic and site-specific community contemplated by Van der Peet capable of holding a constitutionally protected aboriginal right". In 2015 Boyden condemned Stephen Harper during the 2015 Canadian federal election, calling his politics "race-baiting" and "fear-mongering". Wenjack. Toronto: Penguin Canada, 2016. Born With a Tooth Toronto: Cormorant Books, 2001. ^ "The making of Joseph Boyden: Indigenous identity and a complicated history". The Globe and Mail. Retrieved 3 October 2018. ^ "Author's claims questioned". 18 March 2017. ^ "Author Joseph Boyden's shape-shifting Indigenous identity - APTN NewsAPTN News". ^ Author Profile: Joseph Boyden in Quill & Quire. ^ "Faculty: Joseph Boyden". Retrieved March 7, 2014. ^ "Algoma's Honorary Degree Recipient is Giller Prize Winning Author". Archived from the original on 2014-02-09. ^ "Joseph Boyden wades into 'very sacred' territory with residential school ballet". Retrieved 1 February 2016. ^ General, The Office of the Secretary to the Governor. "The Governor General of Canada". Retrieved 20 January 2017. ^ "What's their story?". CBC News. September 29, 2008. ^ ""He has agreed to be my brother" Why Lisa Meeches is adopting Joseph Boyden - APTN NewsAPTN News". ^ "Author Joseph Boyden's shape-shifting Indigenous identity". APTN National News. Retrieved 23 December 2016. ^ "Joseph Boyden's statement about his indigenous roots doesn't address main controversy, academics sa". National Post. 2017-01-13. Retrieved 2018-09-07. ^ "Joseph Boyden Defends Indigenous Ancestry After APTN Investigation". HuffPost Canada. 25 December 2016. ^ "Joseph Boyden must take responsibility for misrepresenting heritage, says Indigenous writer". Retrieved 20 January 2017. ^ "There is room in our circle for Joseph Boyden". Retrieved 20 January 2017. ^ "Can Joseph Boyden make amends with First Nations?". Retrieved 20 January 2017. ^ "Joseph Boyden, where are you from?". Retrieved 20 January 2017. ^ "What Colour Is Your Beadwork, Joseph Boyden?". Vice. ^ "Prominent authors face backlash over letter to UBC over Steven Galloway firing - Toronto Star". Retrieved 20 January 2017. ^ "What it means to be Indigenous: Boyden raises difficult questions". Retrieved 20 January 2017. ^ "Boyden admits to mistakes, backs down as indigenous spokesperson". Retrieved 20 January 2017. ^ a b "Joseph Boyden addresses his heritage in exclusive interview with Candy Palmater". Retrieved 20 January 2017. ^ "Reaction To Joseph Boyden's New Interviews - CANADALAND". 13 January 2017. Retrieved 20 January 2017. ^ "Joseph Boyden's first interview 'a start' but it leaves unanswered questions". Retrieved 20 January 2017. ^ "Things Joseph Boyden Has Claimed To Be But Is Not - CANADALAND". 29 December 2016. Retrieved 20 January 2017. ^ "My name is Joseph Boyden". Macleans.ca. 2 August 2017. ^ "Joseph Boyden Won't Find Indigenous Identity In A Test Tube Of Spit". CANADALAND. 2017-08-04. Retrieved 2017-08-12. ^ Miller, Matt. "A DNA test won’t explain Elizabeth Warren’s ancestry (You're not 28 percent Finnish, either)" Slate. June 29, 2016. Web. n. pag. Archived August 19, 2017 via the Wayback Machine. Retrieved September 3, 2017. ^ Geddes, Linda. "There is no DNA test to prove you’re Native American." NewScientist. February 5, 2014. Web. n. pag. Archived March 15, 2017 via the Wayback Machine. Retrieved September 3, 2017. ^ "The making of Joseph Boyden". The Globe and Mail. 2017-11-12. Retrieved 2018-09-07. ^ Berger, Yael. "Author Joseph Boyden takes on Stephen Harper". Retrieved 10 October 2015. ^ "Joseph Boyden wins $50K Giller Prize Author vows to 'always write about the First Nations'". CBC News. November 11, 2008. Retrieved 2009-10-05. ^ "Boyden wins literature's Giller", The Globe and Mail, November 11, 2008.